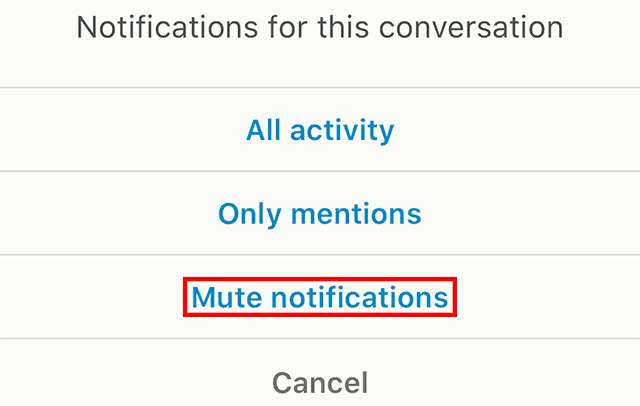 Did you know that LinkedIn allows you to mute conversations so that you no longer receive notifications when a new message is received? You can mute both one-on-one and group conversations. Our guide will show you how this works. Note: These screenshots were captured in the LinkedIn application on iOS. Step 1: Tap the “Messages” icon at the bottom of the screen to go to your message inbox. Step 2: Swipe from right to left on the conversation you wish to mute. Step 3: If this is a one-on-one conversation, tap “Mute” to mute notifications for the conversation. Step 4 (optional): If you tapped “Notify” in Step 3, tap “Mute notifications” to turn off notifications for this group conversation. Note: You can also tap “Only mentions” if you only want to receive notifications when you’re mentioned in the conversation. If you ever want to unmute a one-on-one conversation later on, repeat Steps 1-2, and then tap “Unmute” to turn notifications back on for the conversation. 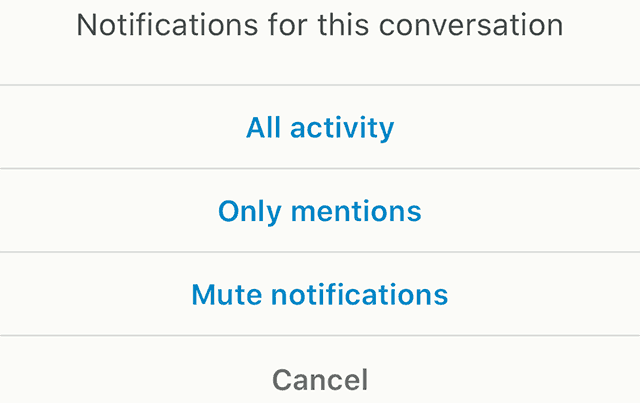 If you want to unmute a group conversation, repeat Steps 1-2, tap “Notify,” and then tap “All activity” or “Only mentions,” depending on the kind(s) of notifications you wish to receive.